Ever heard the phrase, 'Perception is reality'? Well, when it comes to your RV's paint job, this statement rings true. Today’s RVs come with a wide selection of colors, dramatic graphics, and expensive multi-layered finishes. Often the paint job alone is well over $10,000 of the total purchase price. The last thing you want to do is have the luster disappear, taking away a big chunk of the value of your expensive RV investment. Your dentist has a saying about your teeth: Ignore them and they go away. The same thinking applies to the beauty and appearance of your RV’s paint job. Ignore the finish and in no time it will look like you just don’t care. Here are 9 ways you can keep your RV’s paint job looking better for longer. 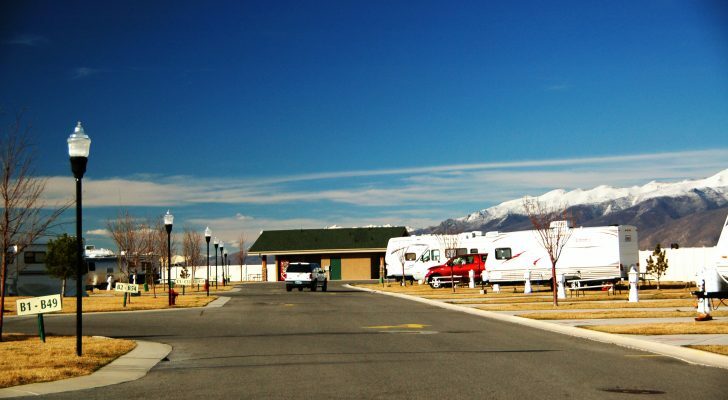 The majority of RVs spend most of their time outside and exposed to the sun and weather. 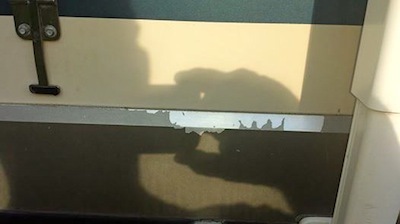 Exposure to direct sunlight will slowly take away the luster and beauty of your RV’s exterior. The sun’s ultraviolet rays will bleach and oxidize the paint or fiberglass coating. You’ll be left with a dull, faded, and generally unattractive paint scheme. 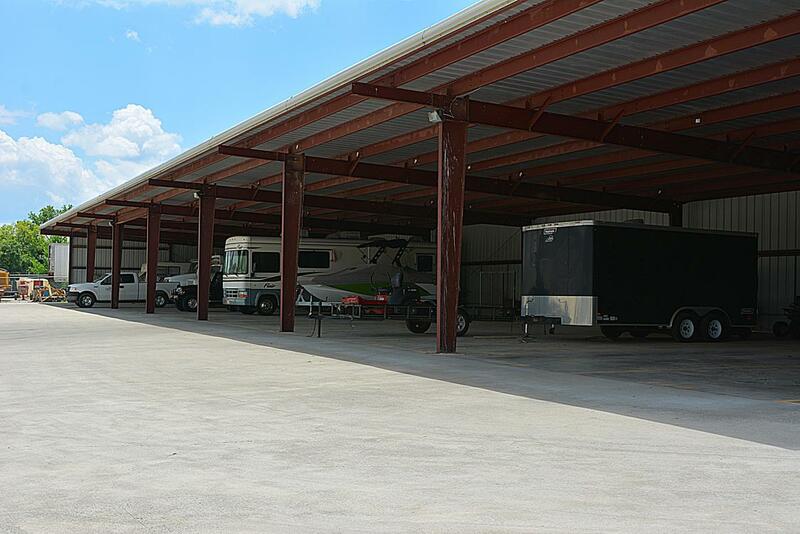 If you need to store your RV outside, strongly consider paying up for a covered storage spot. If you have enough space at your own residence, consider building a covered storage area like this one. 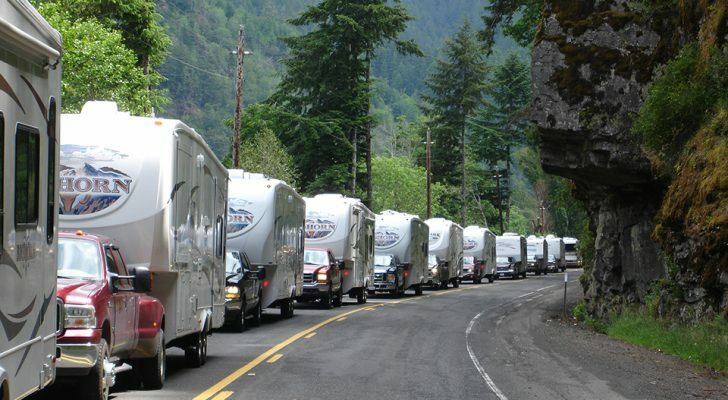 Parking your RV under trees will often increase the length of time that water sits on your RV’s roof. With standing water comes your fungi friends: mold and mildew. During a rain leaves usually drop from trees due to the force of the wind and water. 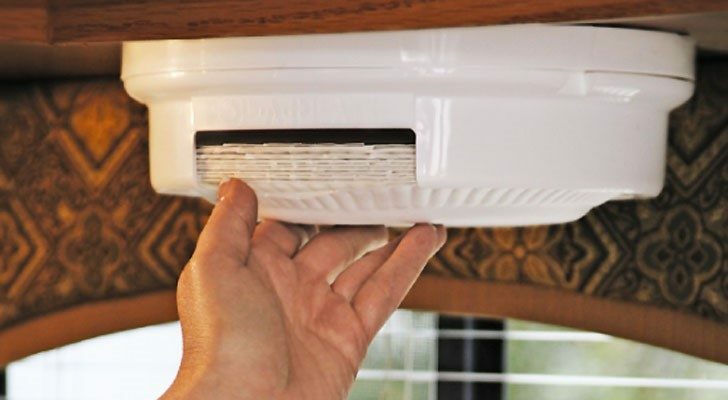 Leaves will accumulate on the top of your RV and slow the evaporation of rainwater. These small pockets of water provide an environment for mold and mildew to grow on the roof of your RV. 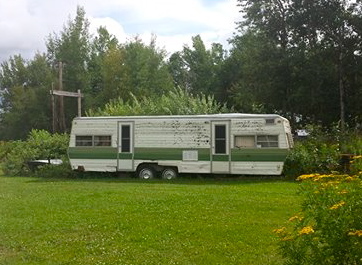 Can you spot the mold on this trailer? Also, before storing your RV outdoors be sure to check the integrity of seams and the general condition of the roof coating. 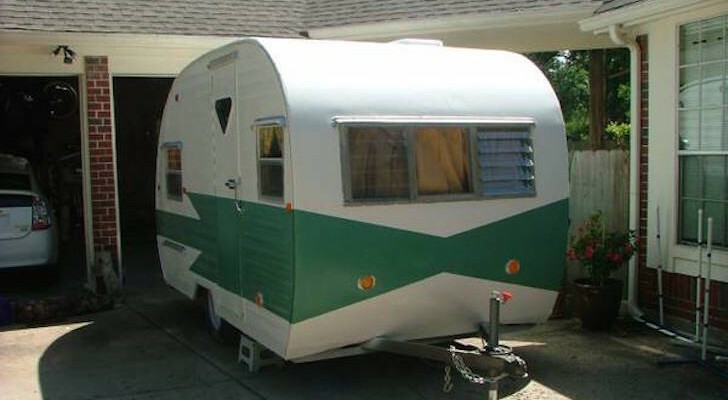 Harsh chemicals and improper cleaning techniques will ruin the finish of your RV in seconds. Strong detergents, especially those applied through a steam pressure washer, aren’t made for the painted exterior of your RV. Sure steam cleans grease and oil from your engine compartment, but if you get careless and let the steam wand wander onto the painted finish you can kiss the paint job goodbye. 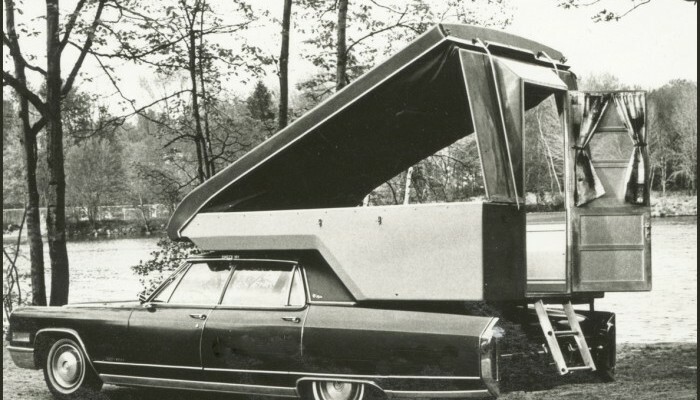 Treat the exterior of your RV like you would treat your RV awning. 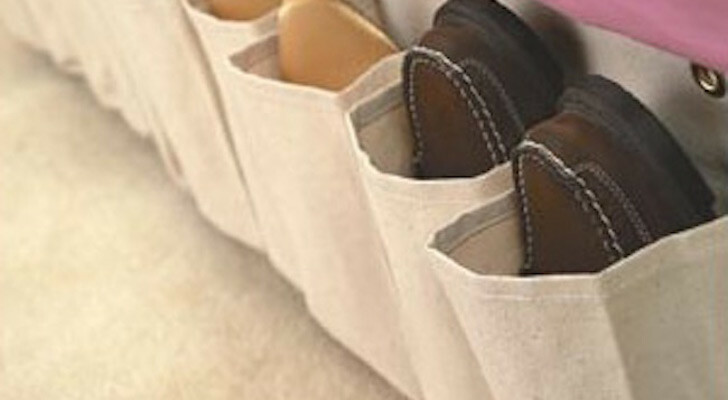 Clean it with gentle soap and water and don’t scrub too hard. 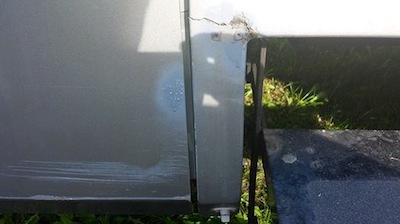 Overzealous buffing will damage your RV’s fiberglass gel coat quickly. Power buffers will speed up the gel coat restoration process, but if used incorrectly can also damage the finish. Hand buffing is sometimes a better option. Your shoulder and arm muscles will usually wear out long before you can damage the fiberglass. If you do want to use a power buffer to freshen up gel coat more quickly, be sure to read this article to learn how to restore gel coat the right way. Boondocking is a great way to see fantastic natural beauty. You can get away from the sometimes crowded confines of an RV park and make yourself one with nature. But these beautiful rural surroundings can leave their mark on your RV. Yes, that small picturesque campsite in the unimproved campground sure looks like the ideal getaway. But if your RV has to rub along tree branches to get there, it may not be worth the price you’ll pay. Dirt and grime can damage the finish of your rig as well. If you drive over a freshly-paved road, wipe off the little specks of tar from the side of your RV as soon as possible. Bug juice can also stain windshields and paint. Use a bug and tar remover to clean up your RV before the sun dries this gunk into a permanent mess. Dirt roads have mostly gone the way of the horse and buggy for good reason: modern vehicles just aren’t designed to travel down them. Small flying rocks will chip away at paint and gel coat, allowing moisture to work its way under the surface. It’s best to stay off unpaved roads unless you decide to accept the consequences ahead of time. Amateur bodywork can make a finish look terrible. Don’t try to fix big scratches by yourself. You run the risk of making your patch job look like this. Stay away from the shaker can paint patch. If you have rock chips, deal with them using a toothpick and dab just enough paint into the chip to bring it back level with the finish. Bird droppings will permanently stain the finish on your RV. Many people think it’s the acid in the droppings that causes the damage to their vehicle’s paint. But new research by Autoglym, a British auto care company, has shown that something else is to blame. The damage to the paint comes from a temperature imbalance caused by the poop shielding the underlying paint from the warmth of the sun. Imagine the sun beating down on your vehicle. The paint gets hot quickly in the afternoon sun and will soften and expand due to the warm temperature. Then a bird poops on your vehicle. The bird poop quickly dries out and hardens over the expanded paint surface underneath. Night comes and your vehicle’s exterior cools. With the cool temperatures, the paint hardens and contracts—a normal process. But where there’s dried bird poop on your vehicle, the contracting paint will mold to the bird droppings, sort of like if you dropped a popsicle stick or a toothpick into a puddle of Elmer’s white glue and then waited a few hours. The wooden stick becomes embedded in the glue. If you remove the stick, the glue still holds the form of where the stick was—sort of like a dinosaur’s footprint in a petrified tar pit. The result: a ruined paint job! Waxes and protectants will do little. Besides identifying the true cause of bird dropping damage to vehicle paint jobs, Autoglym determined that paint protectants and waxes do little to protect from the effects of the hardening of the soft paint around the droppings. The only way to avoid this type of damage: wipe off the bird droppings as soon as possible. And if you have trouble with birds in your outdoor storage unit, see this article for ways to prevent birds from nesting. The best way to take care of the paint job on your RV is to wash it regularly using warm water, mild detergent, and a soft automotive car wash brush. 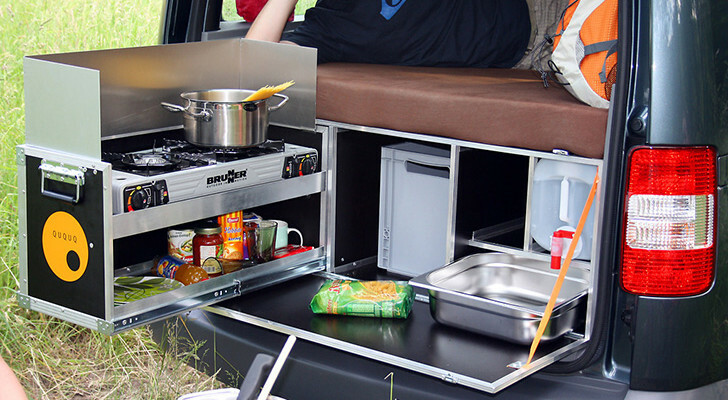 Treat the exterior of your RV like you would the fabric on your awning. 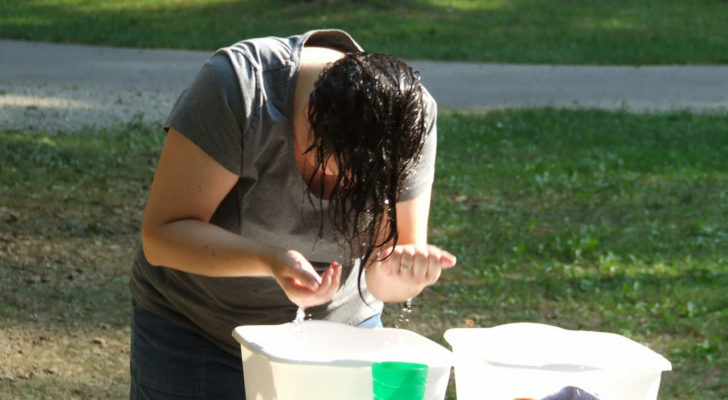 Rinse thoroughly and allow the sun to dry it completely. It’s a good idea to wax your RV twice a year, but at least once a year is a must. During periods of nonuse, store your RV under a covered structure or invest in an RV cover. The best would be to store it inside a garage but not everyone has that ability. If you make the effort to take care of the paint job on your RV, you’ll be rewarded with at least a good-looking rig. And when it comes time to sell or upgrade, you can take the extra value right to the bank. 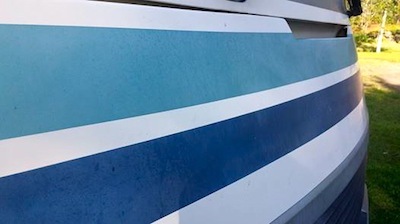 The Headline is 9 ways to screw up your RV’s paintjob. But all 9 things tell you how NOT to screw up your RV’s paintjob. Good info though! I have been using Nu Finish Liquid Polish for over 30 years now. I have tried other brands but have always come back it.